The team here at Alan R Jones & Sons Ltd are celebrating today as the company has won a major business award through national pallet network Palletline. The Palletline Excellence Awards are hotly contested and coveted by Palletline depots nationwide as a real measure of achievement and recognition. 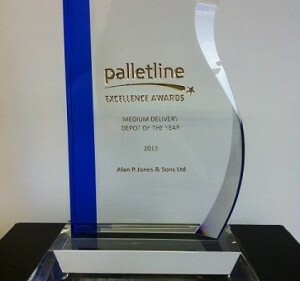 This award naming us (Alan R Jones & Sons) as ‘Medium Delivery Depot of the Year 2013’, formally recognises the company’s achievements based not only on volumes delivered but also rewarding compliance with network requirements, accuracy and sustained service levels. Quality of service is a vital issue to us all at Alan R Jones & Sons. This is the third time in four years that the company has scooped this prize, as well as featuring as runner up and being consistently in the frame over the past decade. “We field a dedicated and professional team here at our Newport Depot “, stated Operations Director Ray Clegg. “Winning this award is a clear reflection of our commitment to excellence in all areas of the business”. We are absolutely delighted to be recognised as a leader in quality and service as part of the premier pallet network PALLETLINE . The whole team are committed to maintaining and exceeding these standards year on year and we would like to thank all our customers old and new for their loyal and continued support in helping us to achieve such a prestigious award.